Chukotka Autonomous Okrug (Russian: Чуко́тский автоно́мный о́круг, tr. Chukotsky avtonomny okrug, IPA: [tɕʊˈkotskʲɪj ɐftɐˈnomnɨj ˈokrʊk]; Chukot: Чукоткакэн автономныкэн округ, Chukotkaken avtonomnyken okrug, IPA: [tɕukotˈkaken aβtonomˈnəken ˈokɹuɣ]) or Chukotka (Чуко́тка) is a federal subject (an autonomous okrug) of Russia. It is geographically located in the Far East region of the country, and is administratively part of the Far Eastern Federal District. Chukotka is the 2nd-least-populated federal subject at 50,526 (2010) and the least densely populated. Chukotka is bordered in the north by the Chukchi Sea and the East Siberian Sea, which are part of the Arctic Ocean; in the east by the Bering Strait and the Bering Sea, part of the Pacific Ocean; in the south by Kamchatka Krai and Magadan Oblast; and in the west by the Sakha Republic. The Chukchi Peninsula projects eastward forming the Bering Strait between Russia and the United States (Alaska), and encloses the north side of the Gulf of Anadyr. The peninsula's easternmost point, Cape Dezhnev, is also the easternmost point of mainland Russia. Large parts of Chukotka are covered with moss, lichen, and arctic plants, similar to western Alaska. Surrounding the Gulf of Anadyr and in the river valleys grow small larch, pine, birch, poplar, and willow trees. More than 900 species of plants grow in Chukotka, including 400 species of moss and lichen. It is home to 220 bird species and 30 fresh water fish species. 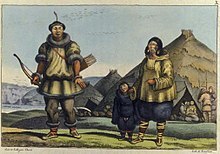 Traditionally Chukotka was the home of the native Chukchi people, Siberian Yupiks, Koryaks, Chuvans, Evens/Lamuts, Yukaghirs, and Russian Old Settlers. From 2001 to 2008, Roman Abramovich was the Governor of Chukotka. He invested billions of rubles, including his own money, into the Chukotka economy by developing its infrastructure, schools, and housing. This has helped to double the GDP of the region and to more than triple the income of its residents. In 2004, Abramovich tried to resign from this position but was reappointed governor for another term by Vladimir Putin. In early July 2008 it was announced that President Dmitry Medvedev had accepted Abramovich's latest request to resign as governor of Chukotka, although his various charitable activities in the region would continue. In the period 2000–2006 the average salaries in Chukotka increased from about US$165 (€117/£100) per month in 2000 to US$826 (€588/£500) per month in 2006. On 11 July 2008, Dmitry Medvedev nominated Roman Kopin to be the governor. On 13 July the local legislators unanimously confirmed Kopin as the next governor of Chukotka. The largest companies in the region include Chukotka Mining and Geological Company (Kinross Gold), Severnoye zoloto, Mayskoye Gold Mining Company (Polymetal), FSUE Chukotsnab. Chukotka is mostly roadless and air travel is the main mode of passenger transport. There are local permanent roads between some settlements, for example Egvekinot-Iultin (200 km). When cold enough, winter roads are constructed on the frozen rivers to connect regional settlements in a uniform network. The Anadyr Highway is under construction to link Chukotka to Magadan, and to connect the settlements of Anadyr, Bilibino, Komsomolsky and Egvekinot within Chukotka. Population: 50,526 (2010 Census); 53,824 (2002 Census); 157,528 (1989 Census). The Chukotka Autonomous Okrug is one of the very few places in Russia where there are more men than women. 1 2,770 people were registered from administrative databases, and could not declare an ethnicity. It is estimated that the proportion of ethnicities in this group is the same as that of the declared group. 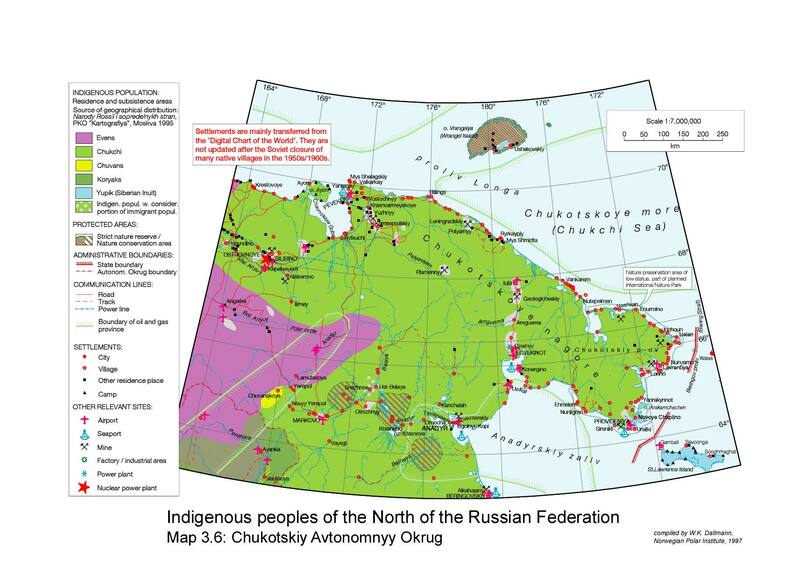 Ethnographic maps shows the Yupik peoples as the indigenous population of some villages near Provideniya, Chuvans in the Chuvanskoye village some 100 km west of Markovo, the Evens in some inland areas, and the Chukchi throughout the rest of the region. The Russian Orthodox Church in Chukotka is represented by the Eparchy (Diocese) of Anadyr and Chukotka (Russian: Анадырская и Чукотская епархия). The controversial conservative Bishop of Anadyr and Chukotka, Diomid, who had occupied the Anadyr see since 2000 and had been instrumental in the development of the church in the peninsula, was removed by the Holy Synod in the summer of 2008. The diocese has been since run by the archbishop of Khabarovsk and the River, Mark (Tuzhikov) (ru). The current governor of Chukotka is Roman Kopin. He replaced business oligarch Roman Abramovich in July 2008. Abramovich had spent over US$1 billion in the region (partly as normal tax payments) on developing infrastructure and providing direct aid to the inhabitants during his time as governor from 2000. In 2004 there were also reports, however, that Chukotka gave Abramovich's company Sibneft tax breaks in excess of US$450 million. Всероссийский центральный исполнительный комитет. Постановление от 10 декабря 1930 г. «Об организации национальных объединений в районах расселения малых народностей Севера». (All-Russian Central Executive Committee. Resolution of December 10, 1930 On the Organization of the Ethnic Clusters in the Areas of Settlement of the Small-Numbered Peoples of the North. ).